Christmas is a time for family. It’s a time to be together. And, more importantly, it’s a time for home. The majority of families stay put when the festive season draws nearer, and it’s easy to see why. However, there are reasons to up sticks and flea abroad this December. It may seem like a long way away, but Christmas is only around the corner. Plus, if you are serious, it is essential to start planning as soon as possible. Below are the reasons to take the whole family abroad this year. People say the lousy weather is part and parcel of the festive season. The thing is the weather is terrible, but not in a good way. Snow hardly ever falls, and, if it does, it’s the weak stuff which doesn’t stick. The last time there was an actual white Christmas was years ago, and the stats don’t suggest it is going to happen anytime soon. So, why not try something different and bathe in sunshine. In the southern hemisphere, the temperatures reach 30 degrees Celsius and the sun cracks the flags. Being outside enjoying the beautiful weather is as appealing as staying inside away from the freezing cold. The idea of leaving for Christmas may not appeal to the kids in the beginning, but they’ll come around. At least, they will if they holiday is Christmas themed. Instead of chasing the sun, you can track the snow. To begin with, at least the prospect of a white Christmas won’t disappoint. Plus, it will feel more like Xmas than ever before. But, where’s best? The Arctic Circle is incredible, especially Lapland. Not only is it home to Santa, but there are lots of activities for families in Lapland. From skiing to dog sledding, the kids will never forget the time they visited Father Christmas. You only have to go once to fall in love and do it again and again. After all, a tradition has to start somewhere. The fact that the experience is brand new may encourage you to leave home for Christmas every year. Let’s face it – there are lots of places to visit. And, it’s a fantastic way to tick activities off a bucket list once and for all. If the kids love it and you enjoy it, why wouldn’t you make it a family tradition? It’s something to look forward to every time December rolls around. By the whole family, it means everyone who is a blood relative. Obviously, they will have to pay for their flights, accommodation and spending money. It may be a time for giving, but no one should give to the point they are dead broke. Still, most of the family should like the idea and tag along for the ride. Rather than spending Christmas at different houses, everyone will be in the same room. So, Christmas dinner will extend from five people to twenty-five. It takes some organizing, but it’s worth it to spend time with family. 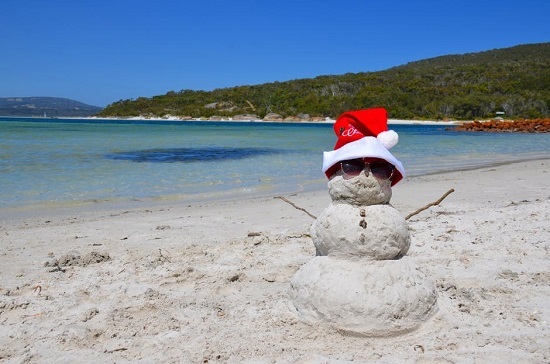 Vacationing at Xmas is different, but it’s worth considering.